Banbury Sailing Club Members can use the Club boats to help them progress their sailing before they purchase their own boat. We have Toppers, Optimists, GP14s and Laser Funs which can be used by our members. All we ask is that you take care of the Club boats as you would your own boat and leave them as you find them. Toppers: Four of these single handed boats are available for members' use. They are ideal for Juniors or beginners who want to improve their skills and in a good breeze can be good fun for an experienced sailor. Optimists: Suitable for juniors aged 15 and under, three boats are available which should only be used with adult supervision. GP14: The Club has three GP14 boats (General Purpose 14 to give them their full name) which can be used by club members although priority is given to those who have completed a Start Sailing Course in this or the previous season. Laser 2000: The Club has three Laser 2000 boats which can be used by club members. 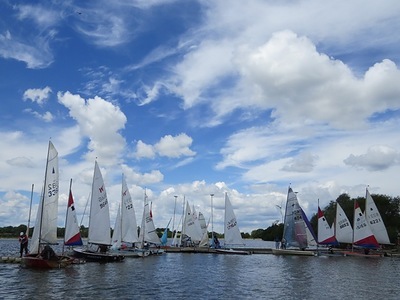 As with the GP's, priority is given to those who have completed a Start Sailing Course in this or the previous season.